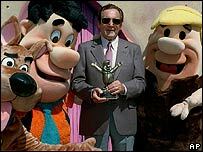 Joseph Barbera, one half of the team behind such cartoon classics as The Flintstones, Yogi Bear, Scooby-Doo and Huckleberry Hound, has died, aged 95. He died of natural causes at home with his wife, Sheila, at his side. "Joe will live on through his work," said Warner Brothers chairman and chief executive Barry Meyer. "The characters he created with his late partner, William Hanna, are not only animated superstars but also a very beloved part of American pop culture," Mr Meyer said. Barbera grew up in Brooklyn, New York and started to pursue a career in banking. But his amateur sketches soon became the raw material for cartoons which were published in Collier's magazine, a breakthrough which then took him into animation. He met Hanna at the Metro-Goldwyn-Mayer film studio, where they collaborated on a 1937 cartoon called Puss Gets the Boot, which led to the creation of cat-and-mouse duo Tom and Jerry. The pair left MGM and formed Hanna-Barbera Studios in 1957, where they created numerous classic characters, including The Jetsons and The Flintstones. Hanna-Barbera extended cartoons beyond the traditional six-minute slots. The Flintstones, featuring two modern-minded couples living in the stone age, was the first animated series to be broadcast on prime-time television. 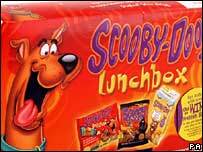 Scooby-Doo, a Great Dane who leads a group of teenagers in ghost-hunting adventures, made his debut in 1969 and the series ran for 17 years, a record for a TV animated series. "They were able to bring top quality cartoon shows to television," said actor Casey Kasem, the voice of Shaggy, Scooby-Doo's unkempt sidekick. "When they came along and they did it, they made it profitable for people who were big investors," he told the BBC. "It's a legacy that he has that has touched people around the world with what I call magic, they just kept producing one great show after another." Who is your favourite Hanna-Barbera cartoon character?